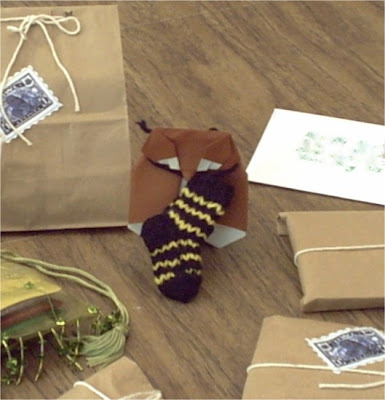 crafty lil' thing: Reducio Sock Swap Gifties! 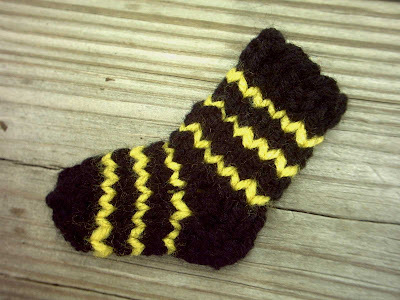 The Reducio Sock Swap is a Harry Potter swap on Ravelry. This is a secret partner swap. You are given the name, Hogwarts house, and address of the person you are to send to, but you don't know who is sending to you. For this round of the swap, your make a tiny sock in your persons house colors, a tiny item based on the theme of Herbology and a letter. The theme changes each month. You can also throw in up to $10 worth of goodies. My swap partner has received her package, so I can show my lovelies. 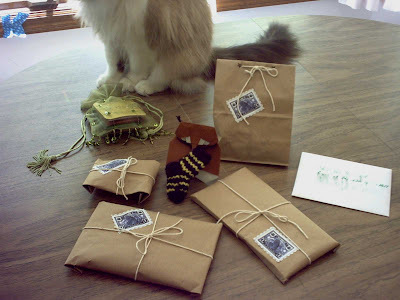 Here is Miss Kitty with the gifties all wrapped up and ready to go. OK, this was my first time ever making a sock, let alone a tiny one. I used plain old worsted weight Red Heart because I was having real trouble working with the tiny sock yarn. I followed a combination of a few patterns in the Reducio resources folder. If you squint real hard, it doesn't look half bad. I sent the sock tied to a little paper owls neck. This is a fold I kinda made up with inspiration. I saw a picture of the final folded owl, but there was no diagram available. So I just kinda stared at it a while and then gave it a couple tries. I think it came out pretty well. It is three dimensional and has a tail that is really cute. I didn't see the back, it just came out that way. Cool. For the Herbology theme, I made a little Mandrake, in a pot for safety of course. You know, I had to make a mandrake! 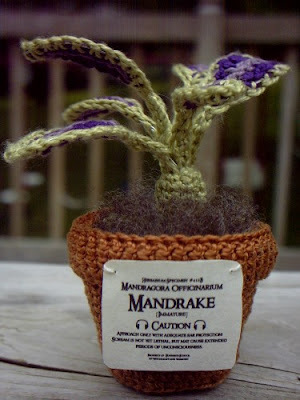 The Mandrake and pot are crocheted with pearl cotton, a No.1 crochet needle and 24 gauge wire to stiffen the leaves. The leaves are variegated with lavender centers, purple mid color and green edges. I really like how they turned out. The pot just kinda happened and I really like the shape. And I added my Mandrake label. Now I think about it, I should have included ear muffs. Oh well. I loved the end result and K begged to keep it. I'm going to do one better, I'm going to teach her to make her own, in worsted weight, because I love her. I also made a set of three stitch markers, which you can almost see in green bag. They are silver with clear crystal beads and each has a charm at the end one that says love, one wish and one imagine. I thought they were really pretty. I didn't get a picture, poo. And I included just for fun, several bags of my favorite teas in a green beaded bag, a Lindt milk chocolate bar, about 25 feet of some wonderful Lionbrand Recycled Cotton yarn in the color Pebble Beach, that I received from Pren (Thank you again Pren! ), and some very organic blank note cards. My partner said she liked it and that the mandrake was lovely. And she said the chocolate was medicinal. I quite agree! And I can't wait for the next round!!!! PJ, I dropped by your blog today (haven't been here in awhile, but I'm a big fan of your mandrake costume) and discovered your mandrake for the reducio sock swap. Would you be willing to share the instructions? Oh dear, I do hate that they grow up and out of their pots. Your little guy was sooo cute in his! He's still adorable, of course, but in a big boy kinda way. My mandrake is all grown up (or at least thinks she is) and wants to be Bellatrix for the HBP premier. I'm trying to talk her into just wearing her uniform and putting sneak on her forehead. No luck yet. I would be happy to share the pattern with you, as soon as I figure out how I did it. I am not terribly good at writing patterns. so it may be a bit. 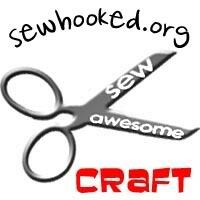 Did you participate in the swap? I'd love to see what you made if you did.